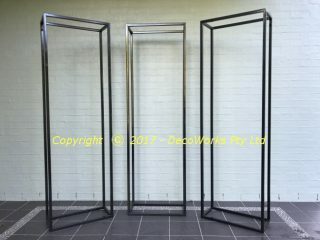 A simple yet effective method for displaying flowers or any object for that matter is to put them into steel display frames. They highlight the objects on display by making them seem as if they are in display cases and imparts a feeling of exclusivity to the items. 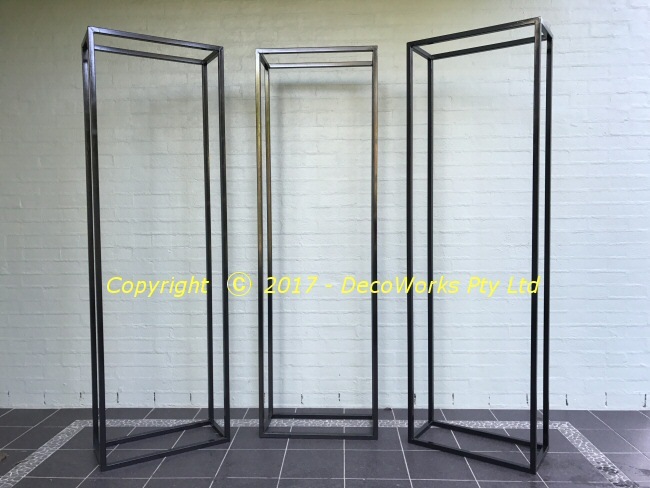 These steel frames are made from 25mm square steel tube and are 2.1m tall, 65cm wide and 30cm deep. Painted gloss black they are free standing and can easily be moved around. This type of frame can easily be made in any size to suit your individual requirements. It is a good idea to fasten the base to the floor or have a strong fishing line tether attached to the tops of the frames to prevent them from falling over if accidentally bumped by a curious patron.